I have commented several times on the parlous income support schemes in Australia that have rendered recipients in an increasing state of poverty as a deliberate ploy by government to create a desperate underclass. We should also never forget that the unemployed (apart from those moving between jobs) are without jobs because the government has chosen not to use its fiscal capacity to cover the spending gap left my non-government spending decisions. Mass unemployment is always a policy choice by governemnt. It can always ensure there is full employment by offering an unconditional job opportunity to anyone who desires to work but is currently unable to find a job elsewere. 1. Why are we so mean to the unemployed? (September 23, 2009). 2. The plight of the unemployed – under growth and decay (November 16, 2010). 3. Our pathological meanness to the unemployed is just bad economics (February 15, 2012). 4. Fat cat bankster wants to make the unemployed even more desperate (August 23, 2012). 5. The indecent inconsistency of the neo-liberals (April 30, 2013). 6. Framing matters – the unemployed and the farmers (August 7, 2018). The summary of the current state is as follows. The Newstart Allowance (unemployment benefit) is adjusted every March and September. 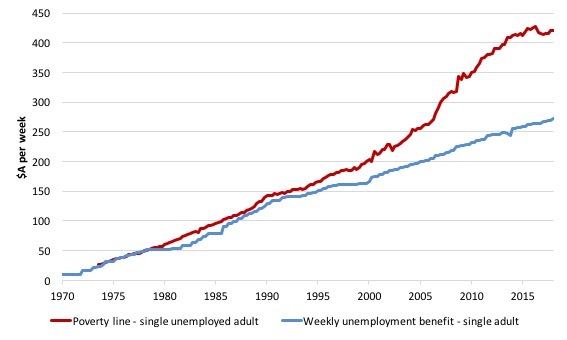 The following graph shows the evolution of the Single Unemployment Benefit and the Single Unemployed Poverty Line since 1973 until March-quarter 2018. The single unemployment benefit stands at $38.99 a day which is well below any reasonable estimate of the poverty line in Australia (for singles at $A60.08 per day). For married couples the unemployment benefit is currently at $70.40 per day, while the corresponding poverty line is set at $85.10 per day. You can date the widening gap between the unemployment benefit and the poverty line to the early 1980s, when the neoliberal mantra about fiscal surpluses really took hold in Australia. As that narrative gained dominance the gap has widened – both sides of politics have embraced it. The Left sold out in other words. So that is where we are at currently. I did an interview for ABC TV last week (the story has not yet been run) about the claims by Australia’s conservative government that ‘they’ have created more than a million jobs since they took office in September 2013. 1. While there are a record number of jobs in Australia, there is also a record population, which makes the claim somewhat wan. You always have to scale the analysis (express in rates) to get the full story. And it is true that the employment-population rate has risen by 1.1 percentage points since September 2013. However, the labour force has also grown by around 1.1 millions (more or less matching the change in employment). 2. However, the unemployment rate is 25 per cent higher than it was at the end of the last cycle (February 2008), so successive governments have overseen an elevated level of unemployment. 3. Further, the quality of work has deteriorated – 48 per cent of the net change in employment has been part-time. 4. While the casual proportion of those part-time workers has risen marginally, the scary statistic is that a sharp rise in prime-age males in full time work but under casual conditions has occurred. So a much larger proportion of primary breadwinners (in Australian culture) are now in precarious work. 5. 75 per cent of the net change in employment occurred in NSW and Victoria, courtesy of the large infrastructure projects the respective state governments have been engaged in (public transport, roads, etc), which has nothing much to do with the Federal government. Taken together those two states only account for 58 per cent of total employment. So there has been a massive disproportionality operating in the last five years because of the public investment. 6. Wages growth is flat and the growth strategy of the Federal government is to reduce its own net contribution to growth and increasingly rely on households running down savings and increasing their debt to disposable income levels. 7. Given there is still around 13.4 per cent of workers either unemployed and/or underemployed (and the participation rate is below historical peaks), there is plenty of room for fiscal policy stimulus to increase employment growth. 8. While total employment growth has weakened in the last 6 months or so, the growth in monthly hours worked has fallen even further. This graph shows the evolution of the two annual growth series since January 1980. 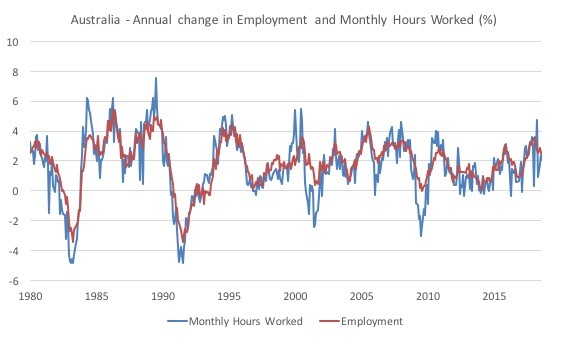 Each time the fall in hours worked has been larger than the decline in employment, Australia has experienced a recession (or a major slowdown). What happens in a cyclical downturn is that firms hoard labour (because of hiring and firing costs) and adjust hours downwards first. If the downturn deepens, they then let labour go. The hoarding propensity is probably lower now because of the shift to more precarious working arrangements, which have pushed the risk of enterprise onto workers and insulated profits. At present both hours worked and employment are growing at modest rates but the hours worked series is trailing and that signals a very uncertain immediate future. Taken together, while employment growth has been positive in recent months and 1.1 million jobs have been created in net terms since September 2013, one has to conclude that the Federal government has been remiss in its policy choices given there is significant idle labour resources remaining in Australia. The ACOSS/JA Report is supportive of that perspective. It provides a very detailed analysis of the demographics underpinning this aggregate data. The details highlight that when employment growth is insufficient, it is the disadvantaged workers who get shuffled to the back of the unemployment queue and face a dismal future. – 29% lived outside metropolitan areas. These cohorts are disproproportionately represented and “struggle to secure paid work”. So even though there has been on-going employment growth, the workers remaining in the jobless queue face multiple challenges. They note that as a result of a policy change a decade or so ago, the Federal government forced people who were receiving the higher disability support pension onto the lower unemployment benefit allowance, which increased the concentration of those with significant disabilities in the unemployment queue. But it still remains that a properly tailored public job creation program can absorb all workers who desire to work into employment. Some years ago I did a major research project with NSW Mental Health working on providing structured employment opportunities for youth with psychosis. The lessons were clear. If a job is provided, structured with clinical support available, flexible enough to cope with episodic illnesses, then a person can be highly productive which then reduces the symptomatic phase of their illness. 2. “Australia underinvests in employment services for people who struggle to secure paid employment”. This is another problem with the ACOSS stance in recent years – it maintains the supply-side bias that characterises the neoliberal era. So, for them it is about training, helping people write CVs etc. However, we can train people until the cows come home, but, if there are not enough jobs available all that is accomplished is that the jobless queue is shuffled. The reason Australia has “to make serious inroads into long-term unemployment” is because there have not been enough jobs created and that is because fiscal policy has been biased towards excessive austerity. Supply-side policy interventions are effective if there are sufficient jobs for the workers to be absorbed into. 3. “the labour market has changed so that jobs that were previously available to people with similar characteristics to today’s recipients of unemployment payment (especially those with lower qualifications and skills) are either harder to get, or harder to keep”. Sure enough but my own research reveals that there are hundreds of thousands of jobs that could be created that would satisfy unmet community and environmental care needs and which would be accessible to the most disadvantaged workers. The private sector, which is motivated by profits, will never produce these types of socially productive jobs. The reason there are not enough suitable jobs for the disadvantaged is because the government has deliberately chosen to leave this cohort unemployed and living in poverty. The ACOSS/JA Report is largely silent on that reality preferring to toe the supply-side line, not matter how well-intentioned their advocacy for the unemployed might be. They clearly understand that there are difficulties in getting work for a large number of disadvantaged workers. The number of un- and under-employed people chasing each job vacancy has declined since 2014, but remains higher than the pre-GFC level. They also noted that in 2016, “there were an average of 14 applicants for every job” but “there was an average of 19 applicants per low-skilled job”. That is a demand deficiency. The solution is simple and within the capacity of the Australian government. The problem is that constructing the ‘problem’ as a supply-side deficiency (more job services, training, etc) deflects the focus on the demand shortage. The disadvantaged are not unemployed because they have disabilities, or struggle with the English language, or are old, or are indigenous, or live outside rural areas. They are unemployed because there are not enough jobs to go round and these ascriptive characteristics then are used to shuffle them to the back of the jobless queue. The ACOSS/JA Report noted that “Among all long-term unemployment payment recipients in September 2017: … 49% were over 45 years”. They also note that there “a growing share of unemployed people are older”. This matters because this demographic comprises the main breadwinners for families. I updated some of the income recipient data the other day, which is available from the Federal Department of Social Services – Labour Market and Related Payments Monthly Profile publications. The following graph shows the shifting age composition of unemployment benefit recipients in Australia since 2009. It is quite a stark pattern. The burden of living on below-poverty-line income support has moved progressively over this period onto the older workers – the most affected being prime age males. In July 2009, the proportion of total unemployment benefit claimants who were male and over 30 years of age was 57 per cent. By July 2018, that proportion had risen to 63.7 per cent. 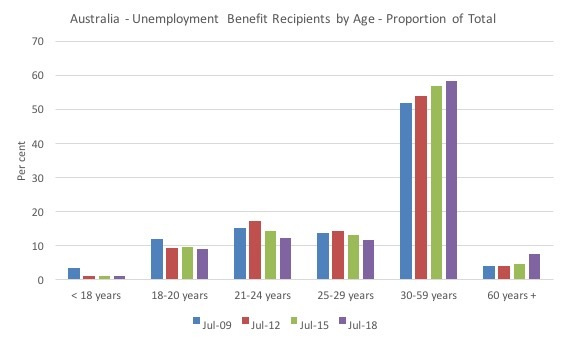 Among the long-term claimants (over 12 months without a job), the proportion was 58.7 per cent in July 2009 and 66.6 per cent in July 2018. While the ACOSS/JA Report considers supply-side solutions in the main they also claim that there are two solutions available to “reduce poverty and prolonged unemployment”. 1. “raise the single rate of Newstart and Youth Allowances so that people can meet basic living costs and search for employment”. I have no issue with this as I have explained in the blog posts I linked to at the outset. I would, however, make the unemployment benefit regime redundant by introducing a comprehensive Job Guarantee program that provided people who are willing and able to work with jobs rather than income support. 2. “refocus employment services towards intensive help that makes a difference, and away from Work for the Dole and other forms of benefit compliance”. Under (2) they argue that “Wage subsidies are more effective than Work for the Dole”, which wouldn’t be hard. The Department of Employment has long acknowledged that its ‘Work for the Dole’ program, which forces the unemployed to work at below legal minimum wages to ‘pay’ for their income support payment is a compliance rather than an improvement program. They just cannot cope with the idea that it is the Government’s responsibility to ensure that there are enough jobs available and if there isn’t they should provide decent income support – which means a payment that allows a person to enjoy a socially inclusive life. That doesn’t mean an enforced state of living below the poverty line. But the emphasis on wage subsidies is the neoliberal corrolary to the supply-side training and motivation emphasis. These two proposals often go together. The concept of a wage subsidy is drawn straight out the mainstream economics explanation of mass unemployment in terms of workers pricing themselves out of work and firms needing a subsidy to bridge the gap between what they must legally pay workers and what those workers end up producing at the margin. This is the neoclassical employment theory that Keynes rejected outright but has remained dominant. So the wage subsidy approach is motivated by the flawed idea that mass unemployment is the result of excessive real wages relative to productivity and if the wage that the firm has to pay is cut – either directly, by the workers accepting a lower wage or indirectly, by the government paying some of the wage – then firms will employ more workers. The problem with decades of policy practice is that wage subsidies typically fail and are an inferior way of stimulating employment. Two obvious points are overlooked, which always conspire to undermine such wage subsidy schemes. First, firms will not employ workers no matter how ‘cheap’ they become if the output that the workers might produce cannot be sold. Firms do not produce to generate infinite stores of inventory. Second, firms might try to substitute subsidised workers for non-subsidised workers as long as the subsidy is in place, which renders any net employment effect negligible. The results show that the odds of being off income support in 12 months are approximately 14 per cent higher for job seekers who received a wage subsidy relative to job seekers who received only a job placement in the same time period, controlling for job seeker characteristics. Which is not a very strong transition probability at all. 1. Workers “who do not have access to their own transport” (a substantial problem). 2. Workers with “disability or medical condition”. 3. Firms said wage subsidies would not improve the chances of them hiring workers who are “Indigenous, have a physical disability or who have a mental health condition”. It is quite a statement that ACOSS, the principle body representing people on income support payments, opts for a neoliberal approach to solving poverty and unemployment. 1. Compulsory, assisted job search – coercion by a privatised job services industry that has an appalling record. 2. Wage subsidies in the private sector – no solution at all. 3. Public sector wage subsidies – why not just offer the workers are proper job. 4. Vocational training – put workers on the treadmill and shuffle the jobless queue. This reinforces the theme I focus on a lot that the progressive elements in our society have become captured by the neoliberal mainstream and cannot think outside that frame. There is actually no mention or analysis of public sector job creation programs in the entire ACOSS/JA Report. It just isn’t on their radar. But, clearly, large scale public employment schemes are the better public policy option to increase employment (especially given the ability of that environment to target disadvantaged groups and make jobs that are accessible) and to provide the necessary income security to alleviate poverty. While supply-siders get excited by a 14 percentage point jump in the probability that a person will be off income support after 12 months, I get excited by the prospect of wiping out mass unemployment altogether by the relatively simple act of a public sector job creation program. That would elevate the probabilities of exiting income support by 100 percentage points. Sadly, groups like ACOSS have a major public voice and the Federal government sees their advocacy as non-threatening. Because the type of policies they advocate are mainstream neoliberal and just more of what the Government, itself, thinks are viable. The irony (or disgrace) is that if these policies were effective then the ACOSS/JA Report would not have had to be written. Just imagine what they could have written about the “Faces of Unemployment” if a Job Guarantee program effectively wiped unemployment out. It would become a very short story of workers moving between jobs. The ugly truth is that the neo liberal cancer just don’t like working people. They don’t like “bottom up” prosperity, and the reason for it is very simple. “Corporate lords” have a harder time kicking them around. Once you understand this about the cheap-labour conservatives, the real motivation for their policies makes perfect sense. Remember, cheap-labour conservatives believe in social hierarchy and privilege, so the only prosperity they want is limited to them. They want to see absolutely nothing that benefits those who work for an hourly wage. You are among the economists I hold in great esteem! I hope we are not too late! ‘Some years ago I did a major research project with NSW Mental Health working on providing structured employment opportunities for youth with psychosis. Bill makes a vital point here if we are to respond to what is considered ‘epidemic’ proportions of poor mental health in the developed world ( depression, anxiety as well as psychoses). As someone who suffers from mental health issues, I have experienced the futility of trying to access support for retraining. I was told by my Job Centre about ten years ago to just ‘stay on benefits’. They virtually admitted that there were no resources to help me back into useful work even after I told them I was reasonably intelligent and would relish retraining for something that would develop my skills and knowledge taking into account my vulnerable mental health. Ten years later here I am with ten years of skill and knowledge development that could have been useful to society down the drain and still struggling with poor self-esteem and trying to find purpose and meaning. I’m sure my mental health would have been in a better place had a JG existed that had the flexibility to accommodate my vulnerabilities. There are many like me languishing and struggling. The progressive era seems to have just been another invention to further enrich the already rich. They killed too birds with one stone by exploiting the possibilities made available by cheap energy while temporarily staving off the emerging calls for deep socialist reform. A wage subsidy is just another form of corporate welfare. If such a subsidy were truly needed to sustain an industry within the capitalist framework, then it’s no longer capitalism is it? That idea among others is really more representative of something other than capitalism. It would be time to socialize technology and the means of production to make things right if that were truly were we’re at today. As cheap energy diminishes the value of human labor increases; the corporate overlords know it, and are trying to re-establish their own position before people even begin to look toward socialism for answers again. You know, come to think of it, it’s actually NOT that crazy to think that 13 and 18 people are going to lose out in those situations. However, people like me have been taught at a young age that this is the way things should be because TINA. The solution offered by neolibs (and regular people I know) is this: Don’t be those 13 or 18 people. I am very sorry to hear that. My imposter syndrome can get very bad but I can’t compare to you and many other people this piece refers to. There is literally no way to escape poverty and mental problems or find self-worth/hope for many people. No two ways about it, conservationism is a festering boil on the face of humanity. The “left” joined them. My mother had to leave work to get surgeries for her eyes (cataracts), she has been out of work for a year now. She has 30+ years experience in the garment industry but she can’t find work as a patternmaker because there are no openings. I used to think that she could be a great teacher with decades of industry experience. However, she will just be teaching ladies going into a saturated field with no employment prospects. All is for naught. People need to reclaim the state. No ways around it: it is either wall street greedy and their useful idiots do economic planning or the people. Its silly to think anything else. ACOSS is pursuing a ‘kiss up for crumbs’ strategy. It’s a crummy strategy that betrays the interests of its alleged constituency. Last year an MMT compliant piece appeared on its Facebook page. It was taken down less than two days later. The power within that organisation needs to be deposed. That sits puzzlingly alongside your generous acknowledgement of Jobs Australia’s co-operation in your 2008 Job Guarantee proposal Bill: “Creating effective local labour markets: a new framework for regional employment policy”. It’s not hard to see how a Job Guarantee could be seen to be a threat to outfits like ACOSS and Jobs Australia, potentially rendering some of their constituencies’ interests redundant. I could tell many stories about my personal dealings as a senior academic with ACOSS leadership in the past – the frustration I have had with their neoliberal leanings and their total ignorance regarding macroeconomics. It is an organisation that has been captured and needs to be liberated before it can fulfill its mission. The leadership at Jobs Australia has changed. Simon, I am sorry to hear of your struggles with mental health and your inability to get decent work. The system is deplorable and the waste of human potential is egregious both for you (and many others) and for society generally. I suppose all we can do is to spread the word about the Job Guarantee and MMT generally. The ideal “charity” “support group” according to the Neoliberal dogma is one that is supported by donations and voluntary work, non aggressive and hopefully hands out contracts or supports the transfer of public monies to private industry. There are many examples of this and ACOSS is but one. Regular “oh me oh my” press releases but avoiding the root cause and direct action. Just like the survival of the Reef and climate change. And the Australia Institute is running a Revenue Summit to “discuss new ways Australia could efficiently and equitably increase public revenue to strengthen both our public finances and our future economy”. And they are supposed to be a progressive think tank! “supposed” is the operative descriptor when it comes to AI in the context of being a “progressive think tank”. There are many supposed progressives who think it is smart to be “in the tent”. It just means they get captured by the language, concepts and narratives of the neoliberals in this case. In the U.S., the agenda of the ruling Republicans (who control the presidency and both chambers of Congress for those who do not recall) on social policy includes seeking work requirements for Medicaid and other programs where they were not imposed in the welfare reform of 1996, which mostly applied to the cash welfare benefit program, TANF (the former AFDC). In essence, the idea would be “workfare” for people to be on a medical insurance program for the poor. Keeping this in mind, there was a laudable (in my opinion), in-depth article explaining why jobs alone aren’t the solution for poverty in the U.S. It gets at a lot of the issues about the “deserving poor,” as they apply to the current debates in Washington. In short, such work requirements won’t result in many more people working but will make things more difficult for the poor seeking needed care. Also, the idea of a basic income grant here does not seem to be a complete red herring in my opinion, though some proposals would use it to replace other (non-cash) programs for needs that might be difficult to address with market purchasing power alone. Here it might be politically thinkable as an acceptable balancing of recent tax cuts that benefited mostly the wealthy. It may be reminiscent of George McGovern’s 1972 campaign promise to give every American $1,000–not bad for its populist appeal! Finally, admittedly there is much work to be done to convince politicians and think tanks of all stripes about MMT principles. Economics very often shows things that are counter to people’s first intuitions.